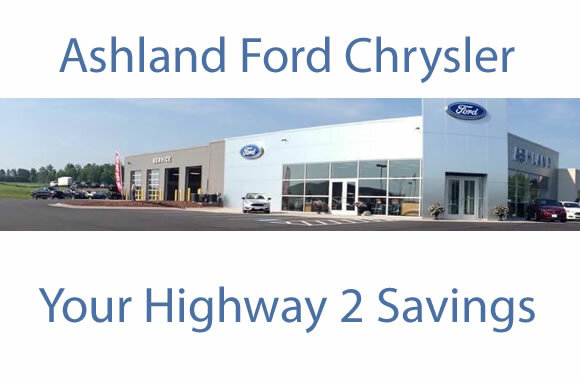 Welcome to Ashland Ford Chrysler, serving the Ashland, WI, area as well as the surrounding cities of Washburn, Bayfield, Mellen, Iron River, Park Falls, and Hurley. Our knowledgable sales staff will help you choose from a large selection of new Ford or new Chrysler cars and used vehicles for sale. We’re sure that our selection of cars, trucks, SUVs, crossovers, vans, and hybrids in Ashland will contain something that will meet your needs. We strive for total customer satisfaction and will do everything we can to provide an outstanding car buying experience from start to finish.